Verdict: 3.9 / 5The Acer Nitro 5 has a price of R13,999, matching that of the Lenovo Legion Y520. Both these units achieve great computing and gaming performance on a budget. As the gaming scene hots up, manufacturers continue to release new devices and peripherals in the local market. This can only be a good sign for South Africans, as more manufacturers mean more competition, better pricing and better equipment for gamers. 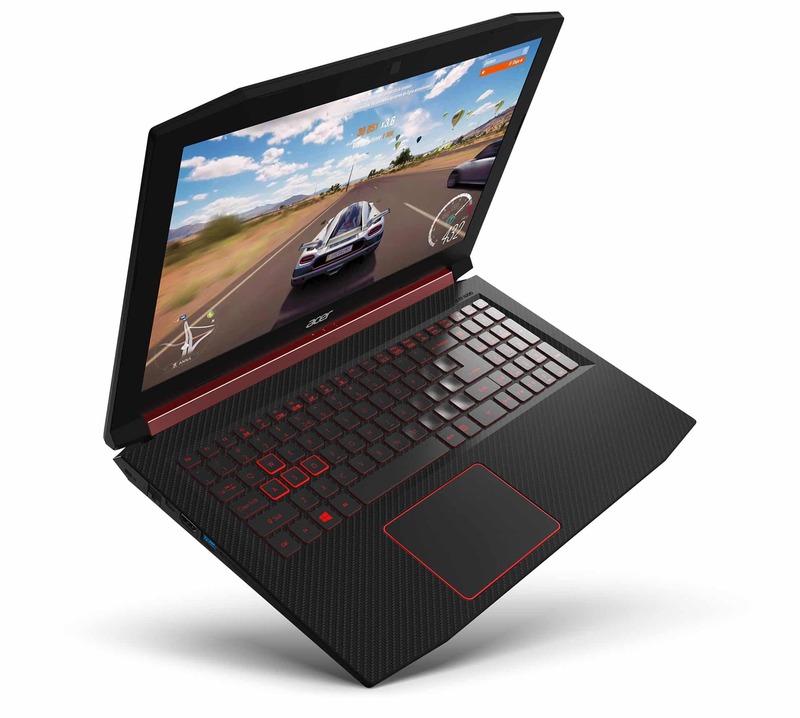 A few weeks back we featured the Lenovo Legion Y520, a budget gaming laptop that ticks the right boxes where it counts. 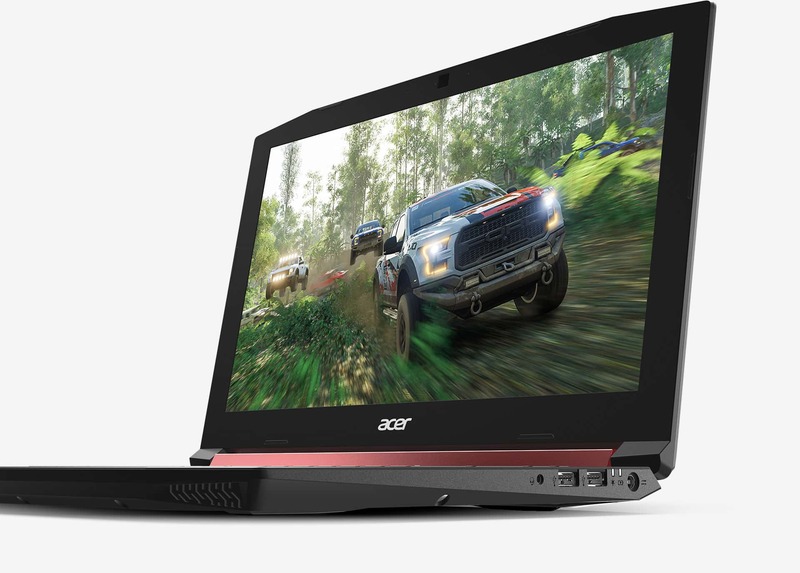 While Acer has a strong lineup of gaming devices from their Predator performance range, as well as a strong business range, there hasn’t been enough for the casual gamer. 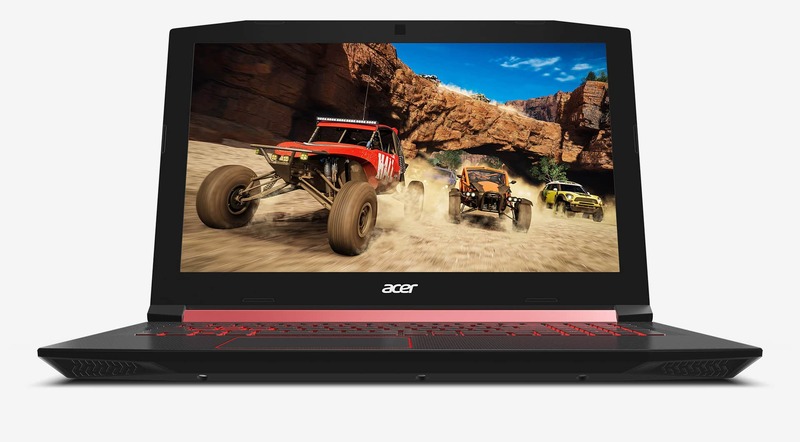 With the introduction of Acer Nitro 5 in 2017, Acer has attempted to change all that. Then, in 2018, the unit received an update. As with the Y520, the Nitro 5 isn’t big on flashy decorations and over-the-top lighting and lines. 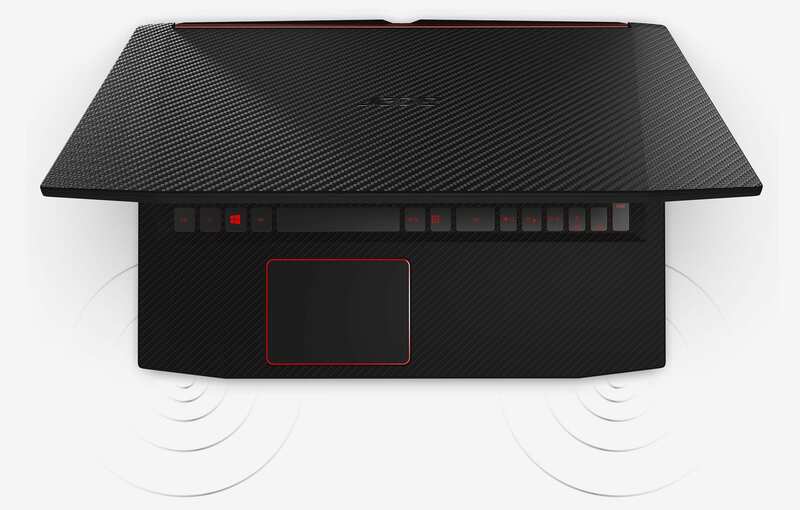 It does, however, sport the same red and black highlights that have become the norm with gaming laptops, even with the more budget of units. Unlike with the Y520, though, the Nitro 5’s lid is a plain plastic exterior isn’t very catching. Thankfully, there are a few trimmings to spruce it up a bit. Starting with the fan grill on the rear, as well as the inner hinge with its red paintwork. Part of the hinge also peaks out on the rear, somewhat tying the red accents of the touchpad and keyboard all the way through to the grill on the rear. In an interesting turn of events, the Acer logo on the lid isn’t glamorised at all. It features a slightly glossy finish that blends into the brushed finish, as opposed to standing out. Despite its predominantly plastic build, the unit is quite sturdy. Part of the appeal also lies in the angular frame, something resembling an oblong hexagon, but not as extreme. There isn’t any real purpose to the shape, apart from being a design choice. Despite its predominantly plastic build, the unit is quite sturdy. There aren’t any notable creeks or screeches. The unit has a decent amount of ports, which include a 3.5mm jack, two USB 2.0 ports and the power input on the right-hand side. The left-hand side features an SD card reader, one USB 3.0, a USB 3.1 Type C, Ethernet as well as a Kensington lock. Again, as with the Y520, there are sufficient ports for most, but you may need an additional USB hub if you need to add one or two more peripherals. Unlike the red accents across the entire laptop, the mould is broken with the blue LED indicators. I’m undecided whether I would have preferred a red LED instead, as the blue does break the pattern, as well as allow you to spot the status of the charger. The Nitro 5 weighs 2.33KG, making it more lightweight than the Y520. The unit measures 391x267x28mm, which is slightly bigger and thicker than Y520. I would put down the additional weight on the Y520 down to the metallic finishings. Unlike many other audio devices on laptops, the Nitro 5’s audio is quite loud. The speakers are loud enough to fill a room but does have some slight drawbacks in that when the volume is turned up, it starts to distort. While it doesn’t quite rattle the keys, it isn’t a comfortable experience while you’re gaming. When the volumes are at more audible levels, the sound is crisp and clear and actually quite pleasing. …the Nitro 5’s audio is quite loud. Moving onto the keyboard, it’s quite comfortable. The keys are soft and well-spaced and are easy to use over long periods of time during day-to-day typing and the likes. When it comes down to gaming, however, it isn’t quite as plain sailing. The softness and ease of use in normal daily life that makes it good are where it comes undone a little during gaming. Often times you aren’t quite sure of each key press and is not as crisp and accurate. In addition to this, the shortcut keys and other gaming keys aren’t included. The only noticeable attribute that would indicate it being a gaming unit is the red highlights around the “WASD” keys but isn’t itself reinforced for gaming. The right-hand side of the keyboard also becomes a bit cramped due to the inclusion of the numeric keypad, which we could’ve easily done without and leave some more room shortcut and more functional gaming keys. Moving down to the touchpad, it’s slightly off-centre in position and aligned with the spacebar, as is often the case. The pad includes the Windows 10 gesture support, as well as a number of shortcuts, such as a four-finger tap to open the Action Centre. You won’t be using the touchpad for any gaming, as it doesn’t lend itself well to any type of gaming. It does, however, fair a lot better in terms of the browsing the web. The Nitro 5 has a 15.6″ screen, which has an IPS display with a matte finish. Unfortunately, as with the Y520, the screen isn’t all that great. The screen suffers from the same lack of colour saturation, with colours that appear washed out. When browsing, the whites are a lot more prominent, which appears a lot warmer than it should be. …the screen isn’t all that great. Thankfully, this can be adjusted by means of the screen calibration settings. The text appeared crisp and clear. The display has a default resolution of 1920x1080px, which is decent enough, and the default for many laptops with a 15.6″ screen. In terms of the colour reproduction on the sRGB colour spectrum, the screen only registers 69%. That’s a whole 1% better than that on the Y520, which also wasn’t great, especially when you compare that to the norm between 90-100% for entry-level devices. In terms of the brightness, the unit has a much better showing around 260 nits, compared to the Y520’s 220 nits. This, however, is still below the average 270-300 nits mark. The 2018 edition of the Nitro 5 features an 8th generation Intel Core i7 CPU. There’s also a variant that includes an Intel Core i7+ CPU for additional speed. The unit also features Intel Optane memory, 32GB worth, as well as 512GB NVMe PCIe solid-state storage. While the design and screen may have achieved subpar results, its more than made up in terms of outright performance with the latest CPU, memory and storage technologies. This makes for impressive results, and ultra-fast bootup times of less than 3 seconds on average. Even as a standalone business laptop, the Nitro 5 achieves brilliant results. Even as a standalone business laptop, the Nitro 5 achieves brilliant results and breezed throughout multi-browser tab tests, while playing a movie without any lag or stutter. Thanks to the Optane memory and NVMe storage, the resultant sequential read and write speeds are equally as impressive. The results include read and write speeds of around 2550MB/s and 1310MB/s, respectively. The unit is also fitted with the same Nvidia GeForce GTX 1050 Ti graphics card with 4GB RAM as the Y520 unit. For most games, the Nitro 5 was able to achieve frame rates around 50fps at 1080p resolution and medium settings. When turning the settings up to max at the same resolution, results hover around the 30fps mark, which is considered the minimum respectable benchmark. Moving onto a few more graphics intensive games such as GTA V, the unit only achieved around 21fps at 1080p resolution on medium settings. The unit scored a 3.5 result on the SteamVR test, which isn’t great but is able to eke out some results for those who wish to play VR games on the unit. That said, I am well aware that most people able to afford a decent VR set would much rather have a more powerful graphics card, and most likely also be able to afford it. When it comes to battery life, the unit is able to reach about 5 and a half hours under normal day-to-day usage. That’s almost a full 90 minutes extra over the Y520 under the same conditions. Again, this isn’t going to be troubling the medium to high-end units with averages around the 6-7 hours mark. For a budget unit, however, these results are quite impressive and will be able to make it through half the day before needing to hit the charger. The Nitro 5 doesn’t have a huge list of proprietary Acer applications pre-installed. These include abFiles and abPhotos, multimedia apps that allows you to view and edit content wirelessly across devices. This also includes Acer Care Centre and Acer Recovery Manager to monitor and track the health of your laptop. There are, however, a few additional pre-installed applications such as Firefox, PowerDirector and also Netflix. These are quite useful to kick-off with. All apps, however, aren’t that useful, but thankfully can be uninstalled, including Bubble Witch 3 Saga, Disney Magic Kingdoms, and Candy Crush Soda Saga. 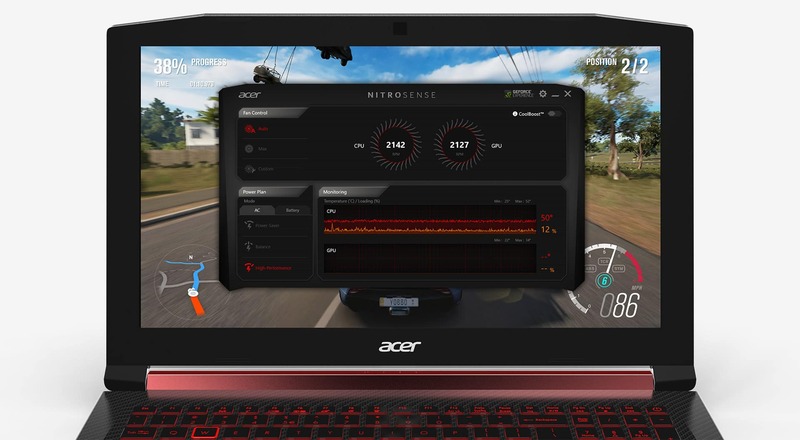 When it comes to outright computing and gaming performance, the Acer Nitro 5 achieves great results. For a budget unit, it punches above its weight and is definitely a great unit for any amateur and casual gamers. In comparison with the Lenovo Legion Y520, the unit achieves similar results across all categories apart from one. And it’s that one, the battery life, that allows the Nitro 5 to shade the comparison tests.